Every season there are a few colors that I gravitate towards and one of them for Spring 2012 is most definitely "Mint"! I personally think it looks sensational and unexpected when paired with black but also adore it paired with a soft palette of cream, khaki or white. When a piece/color can be that versatile, it is a win win in my fashion book! Hope this inspires you to find something "mint" for your Spring wardrobe. Happy Shopping! I know the color of the year is Tangerine Tango and as much as I love it, I've been even more obsessed with a certain pastel hue. I've been on the hunt for mint pieces to add to my wardrobe for weeks and weeks. Unfortunately, a rather BIG baby bump prevented me from indulging in my mint obsession, until I came across this gorgeous statement necklace. It pops against my plain black maxi and I can see it working with more neutral hues, as well as prints. Score! 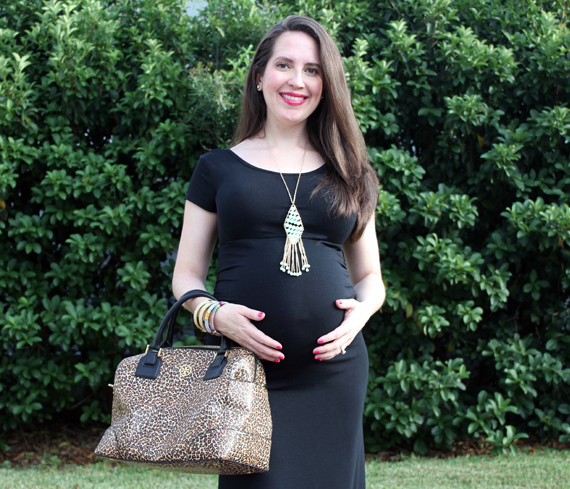 Be sure to check out Thirty Something Fashion and BonBon Rose Girls to see their full post! This was so fun! And you look amazing...Love seafoam and mint together! Anna you look beautiful, glowing!! I love the fresh pastels like mint this season, the colors are more saturated!! 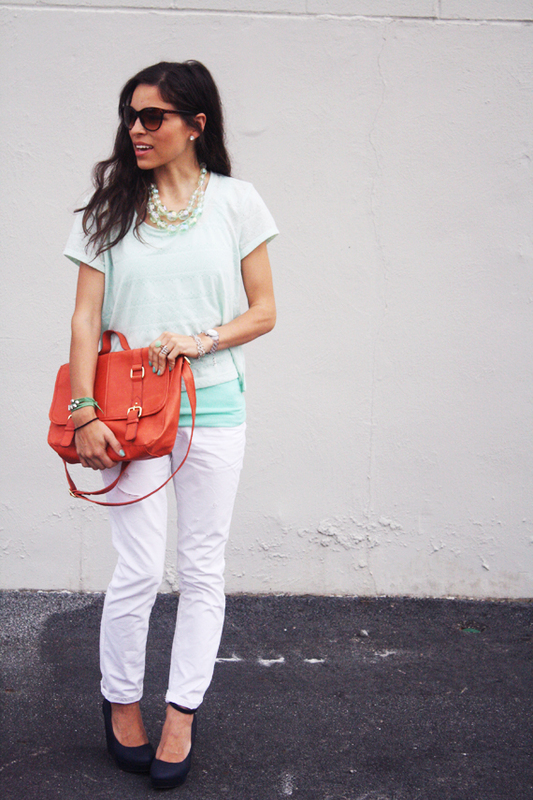 Loving the mint and tangerine together! I always have troubles buying mint/bluish tops because I never know how to pair them with jeans. I guess it's about time I get some white skinny's to solve that problem! Very cute outfit! I am so obsessed with mint these days! It's just such a fun, fresh color! 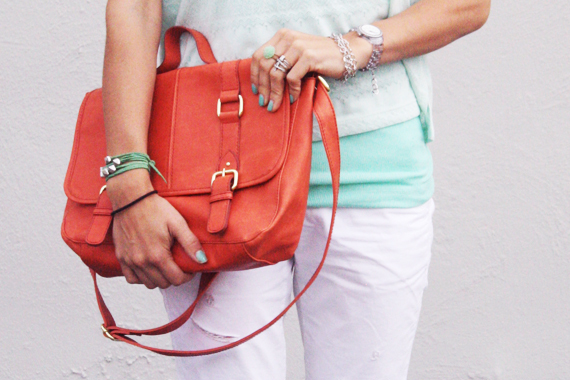 The bright orange bag is the perfect touch to this outfit! I love this idea of different outfits based on the same idea! Love you ladies in the mint! Oh all of the looks are so great. Mint is great for spring. It just looks and feels so light and fresh! I love mint too. It really has become my favorite color. Ah! I love this outfit... its so summerish... makes me happy! Love how each look packs a different minty punch! Love this post! You all look beautiful! I'm a huge mint fan and absolutely love the idea of mixing it with seafoam. 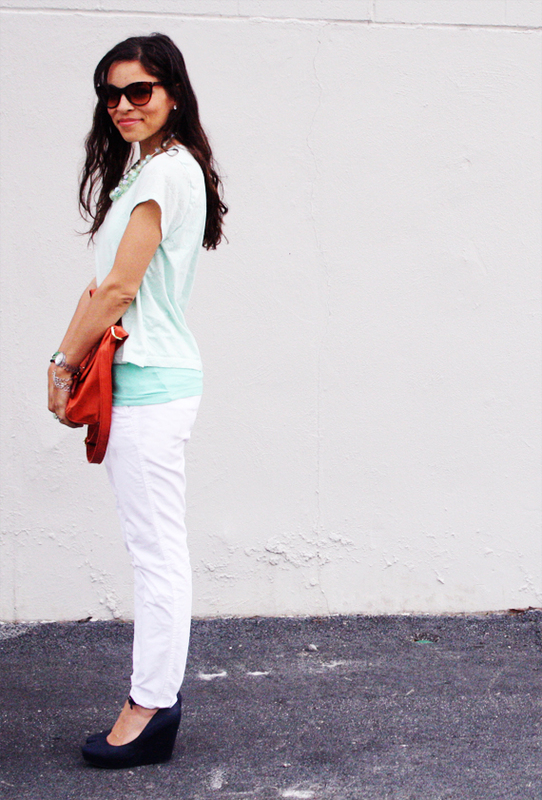 I have always loved mint paired with tangerine/or coral! Such a great outfit, and such an inspirational post! My gosh could Kristen be any prettier???? Beautiful! I'm obsessed with mint this season. I love it with the seafoam and also the coral. All three of you look gorgeous in mint! 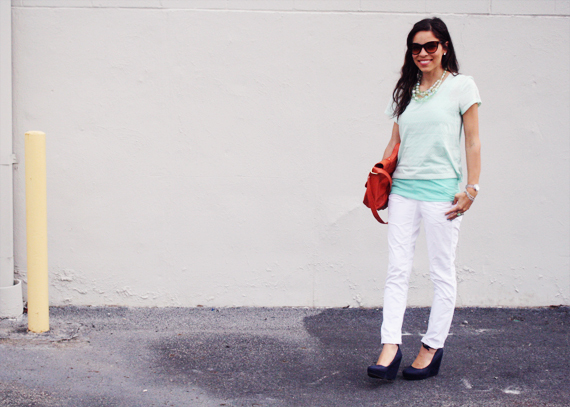 And you're right about the seafoam-mint combination--they do go together beautifully! I want those shoes(but I would be 7 feet tall!). oh my gosh! i got that exact same orange bag last week. LOVE. Love it! Mint is so awesome! Seafoam and mint are so close in the color family that I basically use the words interchangeably, but when you pair them like this, I can totally see the difference - I love a good monochromatic look, like this one. MINT! i seriously have got to jump on the bandwagon with this one. i love your outfit. you always pull everything together so nicely. classy lady. i suppose that's why i love this blog. Super cute looks! Loving the mint blazer! Very Nice! Minty color is suiting on you.You are looking very fresh and cute. Indeed, great looks..love this post!